During the last meeting cycle of our professional development groups, pairs of staff members brainstormed interdisciplinary "big ideas" for potential Challenge Based Learning projects for our students. Considering that the limited aim, progress and reach of some of the projects being developed within departments, I'm searching for a way to entice the true adventurers on the staff to stretch for challenges that will truly excite them and their students. I'm beginning with a survey. I've selected a set of ideas that I think have potential, but I want to narrow these fine suggestions from our brainstormers to an elite set of 3-5 topics. 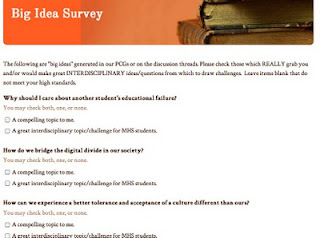 I've asked our staff to rate them according to a) topics which are compelling to the staff member B) topics which would provide a great interdisciplinary challenge for students. Readers of this blog are welcome to participate as well (click the link below). Where do I take the results? Well, I have a meeting with our administrative team to make a proposal. How would you facilitate interdisciplinary challenges on these topics. Please comment here or privately! I am quite impressionable at this point.